Sometimes you can’t take Brenda anywhere because she’s from Idaho and only pretends to be French when she’s in Rome. What a lunatic, right?! Although, at the prospect of mingling among other people while tasting great wines like Fantastique Pinot Noir & King Rabbit Malbec and ogling beautiful, pop-hybrid artwork by Gildas Coudrais, I think I’d drag Brenda along…and about 12 of my other friends from various mid-west cities. 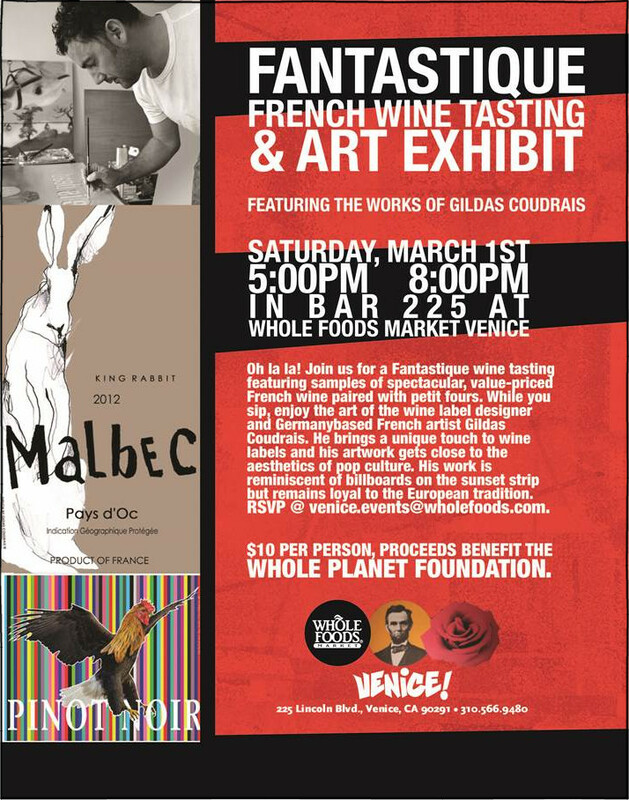 Luckily, this Saturday, March 1st at the Whole Food Markets Venice store, they’re hosting just such an event from 5-8pm. Plus, tickets are a measly $10 and the proceeds will be going to benefit the Whole Planet Foundation. Keep up with all the events of the evening by following Whole Foods on Facebook & Twitter. Let me know if you plan to attend this awesome event in the comments below! Damn, You Fine! Print: I was provided the details of the event and some cash money from Whole Foods to share this with you. That’s pretty cool and all, but the silly and awesome that just happened is because I’m my own woman.